Updates from ESPN Podcasts: Herbstreit, NFL, "30 for 30" - ESPN Press Room U.S.
On Wednesday, Aug. 30, ESPN Audio launches Herbstreit and Fitzsimmons, featuring ESPN’s lead college football analyst, Kirk Herbstreit, and his former radio partner in Columbus, Ohio, Ian Fitzsimmons. It will be posted on Wednesdays during the season. Fitzsimmons hosts Freddie & Fitz with Freddie Coleman on ESPN Radio late weeknights. He also provides sideline coverage on ESPN Radio’s college football and NFL broadcasts. 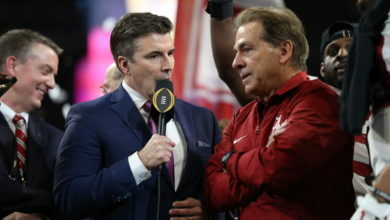 Herbstreit, who has been on College GameDay since 1996 and shares the ABC Saturday Night Football booth with Chris Fowler, is going to call three games in five days, all in prime time: Ohio State at Indiana on Thursday, Aug. 31 (8 p.m., ET, ESPN), ABC’s Saturday Night Football featuring Florida State versus Alabama on Saturday, Sept. 2 (8 p.m.), and Tennessee versus Georgia Tech on Monday, Sept. 4 (8 p.m., ESPN). In addition, the Championship Drive podcast has been rebranded Campus Conversation, expanding the scope of its coverage from college football to all college sports. It will continue to feature many of the voices familiar to listeners: Ivan Maisel, Matt Schick, Heather Dinich, Chris Low, and Adam Rittenberg. The group now also includes Peter Burns of the SEC Network, and, in a new special Sunday edition, SportsCenter’s Matt Barrie and SEC Network host Paul Finebaum. A new Campus Conversation will be posted three times this week and next, then five times per week through the Heisman Presentation in December, followed by three editions each week through the National Championship Game in January. ESPN Audio will launch a new weekday NFL podcast, The Nickel Package, on Monday, Aug. 28, with five distinctly different episodes and hosts each day of the week. Monday: Hosted by ESPN NFL Insider Field Yates, who will also continue to co-host Fantasy Focus Football each weekday with Matthew Berry and Stephania Bell. This season marks the 10th season of Fantasy Focus Football, all with Matthew Berry. Tuesday: Hosted by David Jacoby of ESPN Radio’s Jalen & Jacoby with ESPN newcomer Cian Fahey, who has written for Bleacher Report, the Guardian, Football Outsiders and is the author of the Pre-Snap Reads Quarterback Catalogue. Cian was born and raised in Ireland, where he still resides, and from where he will host this podcast. Thursday: Hosted by Mina Kimes and The Undefeated’s Domonique Foxworth. Friday: Hosted by Mike Golic Jr., who will continue hosting First & Last weekday mornings from 4-6 a.m. ET on ESPN Radio. In addition, Know Them From Adam enters its first NFL season, having launched earlier this year with ESPN NFL insider Adam Schefter. His conversations with the biggest names in and around football are posted on Wednesdays. Season one of ESPN Films’ 30 for 30 Podcasts series recently concluded, but fans now can hear five bonus episodes in their podcast feed in the coming weeks. 30 for 30+, a series of conversations with producer/host Jody Avirgan and some of the filmmakers behind recent ESPN Films documentaries, have begun. In July, “30 for 30” podcasts were the most popular of the 30 original ESPN podcasts. The series had more downloads per episode than any other ESPN offering in 2017, with 2.4 million downloads since launching in late June. In the 30 for 30+ series, Avirgan and the filmmakers go behind the scenes of these recent documentaries and dissect some of the larger themes and storylines as well as discuss some elements that didn’t make it into the final version. Listeners will hear “Mike and The Mad Dog” director Daniel Forer tell how he learned that the legendary radio duo was open to a reunion and “Wally and the Worm” director Colin Hanks reveal what he learned about the legendary Bulls team of the ‘90s in telling the story of Dennis Rodman’s escapades. Season two of 30 for 30 Podcasts, with all-new original audio documentaries, will return in the fall.